From the long, hard running American Interstate comes the latest incarnation of alternative country anti-hero Mark Browning. With disdain for the singer-songwriter stereotype and a spirit of collaboration, the collective “OX”, has become Browning’s new voice for the deconstructed pop song and the anthem of the musically disenfranchised. Sonic accidents; wilted, broken, skeletal … “Americana” at it’s low-fi best, Dust Bowl Revival made Canadian independent music history in 2004 by reaching #1 on the National College Radio Chart … displacing Radiohead’s Hail To The Thief from top spot. 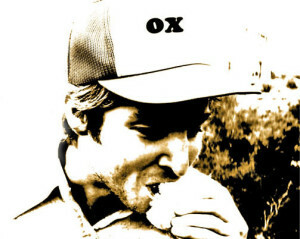 Subsequently, ceaseless international touring, and label deals with Canada’s Maximum/Universal, and the Scratch have helped make OX one of Canada’s premier musical voices. – Ox’s Dust Bowl Revival is the first independently released record to top the Canadian National College Radio Chart. – Dust Bowl Revival reaches #4 on the European “Americana Chart” as an import. – OX’s EP release shared with Kid Lightning (Dave Gibbs, Gigolo Aunts) reaches #17 across canada. – Second Nature Recordings licences Dust Bowl Revival … OX’s first full US tour follows in fall of 2005/2006. – Dust Bowl Revival is the collaborative effort of Mark Browning, Nathan Lawr (Royal City), Chôn (Radiogram), Jesse Zubot, (Zubot & Dawson), Geoff Hicks (Paperboys), Cosmic Dave & Ruby Loves U.